Cartman’s mother plots to give the boys the chickenpox by sending them over to Kenny’s for a sleepover. 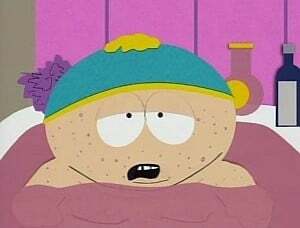 Both Stan and Cartman breakout, but Kyle remains immune. Kyle discovers “the parental conspiracy” and with the other boys hires a prostitute to give their parents herpes. Meanwhile, Kenny’s mother and Kyle’s mother reunite their husbands who were both childhood friends that drifted apart.